The University of Michigan Cardiac Transplant Program is the leading cardiac transplant center in Michigan, performing more than 30 cardiac transplants a year. The Cardiovascular Center has three adult cardiac transplant surgeons and seven heart failure and transplant cardiologists with advanced training in managing the complexities of this patient population. Because the University of Michigan is a high volume transplant center, we provide the multidisciplinary care required for the complex transplant patient, encompassing specialists in advanced circulatory support, cardiac critical care, nutrition, social work, congenital heart disease, inherited cardiomyopathies and transplant infectious disease.  We also enroll all patients under the care of a University of Michigan cardiac transplant specialist into our post-transplant telemanagement program. As a result of this multidisciplinary approach, University of Michigan Cardiac Transplant Program boasts a 91% three year post transplant survival rate, compared to an expected survival of 79%. We have performed nearly 800 adult heart transplants. A heart transplant is an operation in which the diseased heart in a person is replaced with a healthy heart from a deceased donor. Ninety percent of heart transplants are performed on patients with end-stage heart failure. Heart transplants are done as a life-saving measure for end-stage heart failure when medical treatment and less drastic surgery have failed. Because donor hearts are in short supply, patients who need a heart transplant go through a careful selection process. They need to be sick enough to need a new heart, yet healthy enough to receive it. Survival rates for people receiving a heart transplant have improved over the past five to 10 years—especially in the first year after the transplant. About 88 percent of patients survive the first year after transplant surgery, and 72 percent survive for five years. The 10-year survival rate is close to 50 percent, and 16 percent of heart transplant patients survive 20 years. After the surgery, most heart transplant recipients (about 90 percent) can come close to resuming their normal daily activities. However, fewer than 40 percent return to work for many different reasons. The heart transplant process starts when doctors refer patients with end-stage heart failure to a heart transplant center for evaluation. Patients found to be eligible for a heart transplant are placed on a waiting list for a donor heart. Heart transplant surgery is done in a hospital when a suitable donor heart is found. After the transplant, patients are started on a lifelong health care plan involving multiple medicines and frequent medical monitoring. Who Is Referred to a Heart Transplant Center? Most patients referred to a heart transplant center have end-stage heart failure. Of these patients, close to half have heart failure as a result of coronary artery disease. Others have heart failure caused by hereditary conditions, viral infections of the heart, or damaged heart valves and muscles due to factors, such as the use of certain medicines and alcohol, and pregnancy. Most patients considered for a heart transplant have exhausted attempts at less invasive treatments and have been hospitalized a number of times for heart failure. Who Is Eligible for a Heart Transplant? The heart transplant specialists at the heart transplant center will determine whether a patient is eligible for a transplant. In general, patients selected for heart transplant have severe end-stage heart failure, but are healthy enough to receive a heart transplant. Heart failure is considered end stage when all possible treatments, such as medicine, implanted devices and surgery, have failed. Patients who have the following conditions might not be candidates for heart transplant surgery, because the procedure is less likely to be successful. Advanced age. Although there is no widely accepted upper age limit for a heart transplant, most transplant surgery isn't performed on patients older than 70 years. Diseases of the kidney, lungs or liver that can't be reversed. Pulmonary arterial hypertension (high blood pressure in the lungs) that can't be reversed. Patients who are eligible for a heart transplant are placed on a waiting list for a donor heart. This waiting list is part of a national allocation system for donor organs run by the Organ Procurement and Transplantation Network (OPTN). To make sure that organs are distributed fairly, OPTN has policies on how donor hearts are allocated. These policies are based on the urgency of need, the organs that are available for transplant and the location of the patient who is receiving the heart (the recipient). Organs are matched for blood type and size of donor and recipient. Guidelines on how a donor heart is selected require that the donor meet the legal requirement for brain death and that the appropriate consent forms are signed. Guidelines suggest that the donor be younger than 65 years of age, have little or no history of heart disease or trauma to the chest, and not be exposed to hepatitis or HIV. It's also recommended that the donor heart not be without blood circulation for more than four hours. Approximately 3,000 people in the United States are on the waiting list for a heart transplant on any given day. About 2,000 donor hearts are available each year. Wait times vary from days to several months and depend on a recipient's blood type and condition. A person may be taken off the list for some time if he or she has a serious medical event, such as a stroke, infection or kidney failure. Time spent on the waiting list plays a part in who receives a donor heart. For example, if a donor heart becomes available and there are two recipients with equal need, the recipient who has been waiting longer will usually get the heart. Patients on the waiting list for a donor heart receive ongoing treatment for heart failure and other medical conditions. Treating arrhythmias (irregular heartbeats), for example, is very important because they can cause sudden cardiac arrest in people who have heart failure. As a result, many transplant centers will place implantable cardioverter defibrillators (ICDs) in patients before surgery. An ICD is a small device that's placed in the chest or abdomen to help control life-threatening arrhythmias. Another treatment that may be recommended to waiting list patients is an implanted mechanical pump called a ventricular assist device (VAD), which helps the heart pump blood. Regular outpatient care for waiting list patients may include frequent exercise testing, assessing the strength of the heartbeat and right cardiac catheterization (a test to measure blood pressure in the right side of the heart). People on the waiting list are often kept in close contact with the transplant center because most donor hearts must be transplanted within four hours after removal from the donor. At some heart transplant centers, recipients receive a pager so the center can contact them at any time. They're asked to notify the transplant center if they're going out of town. Recipients often need to be prepared to arrive at the hospital within two hours of being notified about a donor heart. Not all patients who are called to come to the hospital will get a heart transplant. Sometimes, at the last minute, the donor heart is found to be unsuitable for certain patients. Other times, patients from the waiting list are called to come in as possible substitutes in case something happens with the selected recipient. Just before the heart transplant surgery, patients will receive general anesthesia, that is, they're temporarily put to sleep. A bypass machine is hooked up to the arteries and veins of the heart. The machine pumps blood through the patient's lungs and body while the diseased heart is removed and the donor heart is sewn into place. Figure A shows where the diseased heart is cut for removal. Figure B shows where the transplanted healthy heart is sutured (stitched) to the recipient's arteries and veins. Heart transplant surgery usually takes about four hours. Patients often spend the first days after surgery in the intensive care unit of the hospital. The amount of time a heart transplant recipient spends in the hospital will vary with each person. It often involves one to two weeks in the hospital and three months of monitoring by the transplant team at the heart transplant center. Monitoring may include frequent blood tests, pulmonary (lung) function tests, EKGs (electrocardiograms), echocardiograms and biopsies of the heart tissue. A heart biopsy is a standard test used to see whether your body is rejecting the new heart. It might be done frequently in the weeks after a transplant. During a heart biopsy, a tiny grabbing device is inserted into a vein of the neck or groin (upper thigh). The device is threaded through the vein to the right atrium of the new heart to take a small tissue sample. The tissue sample is checked for signs of rejection. You and the team also will work together to manage the transplant medicines and their side effects, prevent infections and continue treatment of ongoing medical conditions. You may be asked to monitor your temperature, blood pressure and pulse when you go home. You will need to take medicine to suppress your immune system so that the new heart will not be rejected. These transplant medicines are called immunosuppressants. They're a combination of medicines that are tailored to your situation. Often, they include cyclosporine, tacrolimus, MMF (mycophenolate mofetil) and steroids, such as prednisone. Transplant medicines may need to be switched or adjusted if they aren't effective or have too many side effects. You will have to manage multiple medicines. Setting up a routine for taking medicine at the same time each day and for refilling prescriptions is helpful. It's crucial to never run out of medicine. It may help to always use the same pharmacy. Keep a list of all medicines with you at all times in case of an accident. When traveling, keep extra doses of medicine with you, not packed in the luggage. Bring your medicine with you to all doctor visits. Side effects from medicines can be serious. These include risk of infection, diabetes, osteoporosis (thinning of the bones), high blood pressure, kidney disease and cancer—especially lymphoma and skin cancer. Discuss any side effects of the medicines with your transplant team, because the dose of a given medicine or the medicine itself can be changed. Report all new medicines to your transplant coordinator. Some transplant medicines can increase your chances of developing infections. You may be asked to watch for signs of infection, including fever, sore throat, cold sores and flu-like symptoms. Signs of possible chest or lung infections could include shortness of breath, cough and a change in the color of sputum (spit). The incision must be checked for redness, swelling or drainage. It's especially important to look for signs of infection, because transplant medicines can often mask these signs. Discuss with your doctor measures you should take to reduce your chances of developing infections. For example, your doctor may recommend that you avoid contact with animals or crowds of people in the first few months after your transplant. Regular dental care also is important. Your doctor may prescribe you antibiotics before any dental work to prevent infections. Many successful pregnancies have occurred after heart transplant surgeries; however, special care is important. If you've had a heart transplant, talk with your doctor before planning a pregnancy. Although heart transplant surgery is a life-saving measure, it has many risks. Careful monitoring, treatment and regular medical care can prevent or help manage some of these risks. Over time the new heart may fail due to the same reasons that caused the original heart to fail. Failure of the donor heart also can occur if the body rejects the donor heart or if blood vessel disease develops in the new heart and causes it to fail. This blood vessel disease is called cardiac allograft vasculopathy (CAV). 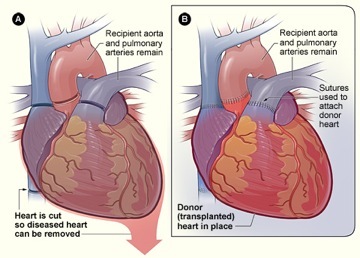 Patients who receive a heart transplant that fails can be considered for another transplant (called a re-transplant). The most frequent cause of death in the first 30 days after transplant is when the new donor heart fails and isn't able to function. This is called primary graft dysfunction. Factors, such as shock or trauma to the donor heart or narrowed blood vessels in the recipient's lungs, can cause primary graft dysfunction. Medicines (for example, inhaled nitric oxide and intravenous nitrates) may be used to treat this condition. Rejection is one of the leading causes of death in the first year after transplant. The recipient's immune system sees the new heart as a "foreign body" and attempts to destroy or reject it. During the first year, 25 percent of patients have signs of a possible rejection at least once. Half of all possible rejections happen in the first six weeks after surgery, and most happen within six months of surgery. CAV is a chronic (ongoing) disease in which the walls of the new heart's coronary arteries become thick, hard and lose their elasticity. CAV can destroy the circulation of blood in the donor heart and cause serious damage. CAV is a leading cause of donor heart failure and death in the years following transplant surgery. It can cause heart attack, heart failure, dangerous arrhythmias and sudden cardiac arrest. Taking daily medicines that stop the immune system from attacking the new heart is absolutely critical, even though the medicine combinations have serious side effects. Cyclosporine and other medicines can cause kidney damage. Kidney damage affects more than 25 percent of patients in the first year after transplant. Five percent of transplant patients will develop end-stage kidney disease in seven years. When the immune system—the body's defense system—is suppressed, the patient is at increased risk for infection. Infection is a major cause of hospital admission for heart transplant patients and a leading cause of death in the first year after transplant. Suppressing the immune system leaves patients at risk for cancers and malignancies. Malignancies are a major cause of late death in heart transplant patients—nearly 25 percent of heart transplant deaths occur within three years after transplant. The most common malignancies are tumors of the skin and lips (patients at highest risk are older, male, and fair-skinned) and malignancies in the lymph system such as non-Hodgkins lymphoma. High blood pressure develops in more than 70 percent of heart transplant patients in the first year after transplant and in nearly 95 percent of patients in 5 years. High levels of cholesterol and triglycerides in the blood develop in more than 50 percent of heart transplant patients in the first year after transplant and in 84 percent of patients in 5 years. Osteoporosis can develop or worsen in heart transplant patients. This is a condition in which bones gradually become thinner and weaker. Not following a lifelong treatment plan increases the risk of all heart transplant complications. Heart transplant recipients are asked to closely follow their doctors' instructions and monitor their own health status throughout their lives. Lifelong health care includes taking multiple medicines on a strict schedule, watching for signs and symptoms of complications, keeping all medical appointments and stopping unhealthy behaviors, such as smoking. More information is available on the Cardiovascular Center Heart Transplant page.